NAHID Ali, 25, and his brother Wasim, 22, are knocking at the doors of a hole-in-the-wall enterprise in a New Delhi suburb that supplies security guards to shops. The brothers are from Moradabad, an industrial-commercial town in western Uttar Pradesh that’s synonymous with its brass handicrafts. Both are graduates of a college affiliated to Rohilkhand University, the elder with a science degree and the younger with a degree in the humanities. There is an air of forlornness about the two young men as they prepare to take up the mind-numbing job of security guards at a fancy retail showroom in Gurgaon, the commercial city abutting the capital. “I don’t care. We have tried everything and I don’t mind doing this as long as my family back home doesn’t know,” says Nahid, who clearly has reached the end of his tether. It is six years since he got his bachelor’s degree in zoology and botany and he hasn’t even made it as an office assistant. He and Wasim have been told they do not even have the soft skills needed to peddle the furniture in the posh shop where they will now work as guards. Wasim’s brooding look is a silent comment on the compromise he has been forced to make for a salary that will just about keep the wolf from the door. What Wasim and six million others have realised is that a security guard’s job is about the easiest option since it’s one of the few booming sectors of the economy (see ‘Six million and counting’). SUKHPAL Singh, 26, from Sayalpur village of Tilher block in Uttar Pradesh counts himself lucky. 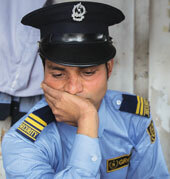 He is a commerce graduate who has joined the ranks of the six million-odd security guards who sit or stand in a catatonic state outside banks, offices, malls and private homes. Depending on which company one works for, guards can be paid as little as Rs 7,000 a month or get a handsome package of Rs 25,000 if well trained and well turned out by the top flight security companies. It’s a Rs 30,000-crore industry of which just about a third is in the formal sector. Singh says his main concern is not boredom, but his wages which are barely enough to meet his needs. There is nothing unique about the circumstances of the Ali brothers. An estimated five million graduates are churned out every year by the hundreds of thousands of teaching shops across the country that provide neither a solid education nor any special skills to these young people. Graduates working as peons in offices and postgraduates carrying head loads as construction labour are not exactly new. Such stories are routine in India where securing decent jobs has always been difficult for the hordes that pass out from these colleges looking for white collar jobs. What is new and unnerving now is the overwhelming numbers of young people looking for employment on account of the changing demographics of the country. A couple of significant statistics stand out in this new demographic profile. Nearly half the population, 48.6 per cent to be precise, of the total 1.21 billion is below 24 years, according to the 2011 census. What India is experiencing is a pronounced youth bulge with around 232 million people in the 15-24 age bracket, up from 190 million in 2001. The median age is 25 compared with 40 for most of the developed economies. Constituting a fifth of the total population, the 15-24 years cohort is the youngest slab in the working age population (WAP) which includes people between 15 and 59 years. It is the WAP segment that has been exciting discussion at home and abroad because with as much as 62.5 per cent of the population in the working age, there is the possibility of India reaping a huge demographic dividend. But a caveat is in order here. Not everyone of WAP will be in the job market. According to the Institute of Human Development in Delhi, the overall labour force participation is just 56 per cent of WAP, a low figure compared to nearly 64 per cent for the rest of the world. This is largely because women participation is a dismal 31 per cent, among the lowest in the world and the second lowest in South Asia after Pakistan. What exactly is a demographic dividend and why is there such a buzz over what this will do for India’s growth prospects? A demographic dividend occurs when the high fertility rates begin to decline and ratio of dependents—that is the young (below 14 years) and the old (over 60)—to the working population is significantly lower. This helps to funnel savings and investments into the economy and gives a huge boost to the per capita income. This is what happened in all the miracle economies of East Asia such as Singapore, South Korea, Taiwan and Thailand which posted a huge growth starting in the 1960s. Economists say these countries experienced a demographic dividend that added a fantastic two per cent to their annual per capita income growth. Can India, too, pull off such a feat? It has set itself a humongous target of skilling a mind-boggling 530 million people by 2022, of which 380 million are the responsibility of 23 government ministries. The remaining 150 million will be trained by the National Skill Development Corporation (NSDC), a public–private partnership between the government and industry. States, too, have set up skill development missions whose goals depend to a large extent on Central government funding. But the odds clearly are daunting. To start with, the current workforce is largely illiterate (see ‘A poor report card’) with just over 18 per cent having completed secondary school because of high dropout rates. And for those who drop out, the prospects are bleak. Very few youngsters are able to start their working lives with any formal or informal vocational training because the vocational training system can train just three million youths, whereas industry requires about 13 million annually. As for the 8.8 per cent of the workforce who are graduates, their employability is dismally low. Every survey of manpower has revealed dismaying rates of employability of even the educated young. A National Employability Report 2013 by Aspiring Minds, a talent assessment consultancy, found that 47 per cent of the 60,000 graduates it tested were not employable in any sector. Worse, less than three per cent of commerce graduates were fit to do accounting jobs. Such bad news has been piling up steadily. The latest, a January 2014 survey, The India Skills Report, by talent outsourcing and assessment companies PeopleStrong and Wheebox in conjunction with industry body CII, found that just about a third of the 100,000 students were skilled enough to secure jobs. Those with a degree in the humanities fared worse, with less than a fifth being employable. A combination of these factors has resulted in a strange paradox. India has the largest labour force in the world and yet it is in throes of an acute shortage of skilled and trained people in the manufacturing and service industries and even in agriculture. Industry claims it is saddled with the highest in-service employee training costs worldwide that undermines its cost-competitiveness. The state of vocational education is dismal with outdated curriculum, outdated equipment and poorly trained teachers, all adding up to a system that needs a complete overhaul. WHEN Abhilash Sharma, son of a teashop owner, decided to get a BA degree in history he had no idea how it would shape his life. After his father died of a heart attack, the shop had to be sold and Abhilash had to fend for his family. Graduates are dime a dozen and Abhilash couldn’t even find a teacher’s job in his native Ballia district in Uttar Pradesh. He tried being a tourist guide in Lucknow but was chased away by the “registered” guides. 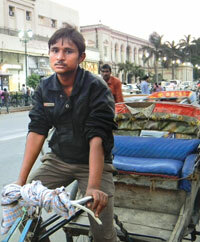 Then in 2010, he managed to get two cycles being distributed by a political leader and exchanged them for a rickshaw. So now Abhilash, 28, is a guide on wheels and makes Rs 500-700 a day, but he is yet to overcome his own bitter history. Electoral calculations and vote bank politics are playing havoc with the prospects of the youth in the Hindi heartland where the youth bulge is set to expand in coming decades. In Uttar Pradesh, the government of Akhilesh Yadav has turned the desolate employment exchanges into youth hotspots by offering not jobs but an allowance of Rs 1,000 per month to every jobless youth registered at an exchange in the state. The dole adds a recurring burden of Rs 2,000 crore annually to the Uttar Pradesh exchequer already groaning under the Rs 200,000 crore debt left by the previous government. In fact, all parties have made promises of a dole, the BJP having dangled an offer of Rs 2,000 a month for every unemployed youth if voted to power. Till March 31, 2013, 1.261 million people had been paid the monthly allowance but since 300,000 more applications have been submitted, payments have petered out. Doles clearly are not sustainable for a cash-strapped government, and with wiser counsel prevailing, the state is now focusing on job-oriented training to as many as 4.4 million over the next three-and-a-half years. The state will be spending Rs 4,200 crore on skilling the labour force, says Vikas Gothawal, special secretary and director of UP Skill Development Mission. But he admits that these figures are way below what is needed in the state. The problem across the country is colossal. Every year 12.8 million new jobseekers are entering the workforce, illiterate and unskilled for the most part. It’s not as if governments were unaware of the impending crisis. The 11th Plan document had noted that 80 per cent of new entrants to workforce have no opportunity for skill training. Although over 12 million new jobseekers were entering the workforce every year, the training capacity is for just 3.1 million per annum or an insignificant 2 per cent. Compare this with the developed world: skill training extends to 96 per cent of the workforce in South Korea, 75 per cent in Germany and 80 per cent in Japan. And there is another vital difference between India and these economies: the bulk of the labour force in India, about 93 per cent, works in the unorganised sector and has no formal training. Take the case of Bihar where the absence of formal training is egregious. A 2013 study on skill development commissioned by the state government has found that of the 40 million young people in the age group of 15-29 years, only 0.3 per cent were receiving formal vocational training at the time of the survey, while another 0.2 per cent said they had at some time received formal training. For the rest, 1-2 per cent reported they had been through some kind of non-formal vocational training. The only thing that appears to work for the young in Bihar is the garage-style training shops that dot the hinterland, run by ustads (reputed teachers) who have worked in oil-rich West Asian countries and most commonly provide training as welders, electricians and fitters. Although policymakers have been talking of the coming demographic dividend since the late 1990s, it is clearly an issue that has not kept them awake at night despite the immensity of the problem. While the NDA government of the BJP did nothing during its tenure, the UPA administration got into the act only in its second term. A policy on skill development was formulated only in 2009, some eight months after the Prime Minister’s National Council on Skill Development was constituted in July 2008 along with a National Skill Development Coordination Board headed by the deputy chairperson of the Planning Commission. But matters appear to have been moving too slowly for the government’s comfort. In January 2011, it appointed S Ramadorai, former CEO of leading software company TCS who continues to be its non-executive vice-chairperson, as adviser to the prime minister for the National Skill Development Council, with the rank of a Cabinet minister. It also committed Rs 1,745 crore to the joint venture NSDC. It is not clear what kind of funding is coming from the private sector which has put in 51 per cent of the Rs 10-crore equity capital of the corporation, the rest being contributed by the government. The private equity partners comprise the three apex business chambers—CII, FICCI, ASSOCHAM—and seven industry-specific associations, each of them holding a 5.1 per cent stake. More recently, the finance ministry announced two tranches of Rs 1,000 crore each for the STAR (Standard Train Assess and Reward) scheme in August last year. This scheme, on an average, will provide a monetary reward of Rs 10,000 to students who undergo skills training and qualify after assessment by an independent agency appointed by the relevant sector skill council. The STAR scheme is one of the largest outcome-based, incentive-driven skill development schemes and has been scaled up to enrol over 360,000 candidates. “We are working with all the stakeholders to bridge the gap between candidates trained, certified and rewarded by scaling up our pool of assessors,” explains Dilip Chenoy, CEO and managing director of NSDC. To date, Rs 6.5 crore has been disbursed to 6,490 candidates and NSDC is trying to get more banks to participate in the scheme. Although there is no consolidated figure of the spending on vocational training, a Planning Commission source estimates that the Central ministries together spend around Rs 23,000 crore currently while the states’ expenditure is another Rs 7,000 crore. This is a considerable sum which produces just about 5 million vocationally trained people. “This is a very ineffective system. For 500 million are we going to increase the spending by 10 or 100 times?” asks Santosh Mehrotra, director-general of the Institute of Applied Manpower Research, Delhi. A consequence of the sudden push on skill development has been a scramble for numbers. With more Central ministries being pressed into the drive—traditionally, only the ministries of labour and human resources development have been engaged in training—and states, too, pushing ahead with their own missions. Close watchers of the unfolding scenario say the chaos is being compounded by multiple training providers registering with multiple ministries across different states, thus leading to an artificial pumping up of the figures. According to Mukti Mishra, chairman of Gram Tarang, the skilling ecosystem is passing through “irrational exuberance resulting in outcome hallucination and numbers deception”. Gram Tarang, one of the earliest partners of NSDC, provides skill training in some of the poorest districts of Odisha which are listed as being in the grip of the Maoists. His contention is that none of the claims made by the different agencies is being monitored or audited. It was to bring some coherence into the sector that in June 2013, the government decided on another organisational shake-up. It set up the National Skill Development Agency (NSDA) as an autonomous body to coordinate the skill development efforts of the government and the private sector and to ensure that national targets are met. NSDA subsumed all of the earlier institutions barring NSDC, but with Ramadorai continuing to head both organisations. What has been achieved so far? With just nine years left to meet the targets, it does seem like Mission Impossible. NSDC, which has a target of skilling 150 million people by 2022, has been able to skill just 1.35 million youths in the past 3.5 years. Although it promises an exponential growth in the next few years it is difficult to see how it can ramp up its output to at least 16.6 million every year for the next nine years. By its own admission it has created capacity to skill just 75 million over the next decade. This is woefully short of the target but as Chenoy points out: “We are just three years old. But we have created the quality framework and occupation standards for different job roles, across 17 sectors. More are in process. This would lead to standardisation and ensure quality of vocational training programmes across the country.” It has developed National Skills Qualifications Framework (NSQF), a quality assurance framework, and also set up 29 Sector Skill Councils which lay down occupational standards according to levels of knowledge, skills and aptitude. This has cleared the huge confusion across states as to what constitutes skills in different trades and occupations. As for the government, it has a sharper peak to scale. Together, 23 ministries and departments have to ramp up their training programmes to meet a target of skilling 350 million people by 2022. That is about 39 million each year. Their combined capacity for vocational training, however, is just 8.7 million a year. No one is clear as to how the vast numbers are to be met and it is likely there will be some fudging of figures. For instance, the Ministry of Agriculture, which had set itself a target of skilling 1.2 million during 2013-14 financial year, is already claiming it has exceeded the target and skilled over 1.56 million at the end of January. No details have been forthcoming. One figure alone is enough to explain how nearly impossible the skills target is. To meet the 500 million figure the country requires 45,000 trainees to be certified and graduated every day for the next 10 years! Currently, there are less than 50,000 trainers. Naturally there is a lot of scepticism if even a quarter of the numbers can be achieved. “We are at the midpoint of our demographic dividend. This window of opportunity is available to India only till 2040,” points out Mehrotra. A demographic dividend of this nature comes but once in the lifetime of a nation, and the economist believes India has not been moving fast enough to reap the benefits, unlike China which rode the wave of its demographic dividend. The government, he says, has done nothing in the vocational education (VE) space in the past five years. While the 11th plan stressed the need to take vocational courses to schools, just 10,000 schools have introduced it. More important, it has done little to modernise and expand the network of industrial training institutes (ITIs), which are the backbone of the VE system. Government ITIs have increased to just over 2,200, while there has been a boom in private sector institutes which have quadrupled to over 8,000. “Who is regulating these private institutes? Is industry satisfied with their quality?” he demands. Since PPPs were thought to be the best way to tone up ailing ITIs, the government had entered into an agreement to upgrade 1,396 ITIs. The total cost of this exercise was estimated at Rs 3,550 crore. But, according to CII sources, only 310 ITIs have come under the scheme, and “about 200 of these are doing well while the rest are in poor shape”. What appears to be working better is the upgradation of 500 ITIs into “Centres of Excellence” with the World Bank funding to the tune of Rs 2,000 crore, part of the costs being shared between the Centre and the states. So, if the country’s skilling mission hasn’t made a dent on the problem what is the prognosis? “If we are not able to provide a proper education and jobs it will lead to frustration and social unrest,” warns Alakh N Sharma, director of the Institute of Human Development, Delhi. “Just think of what will happen in the next 10 years. There’s going to be an explosion”. As aspirations of the youth rise, the lack of any employment may lead to increasing urban crimes and violence, according to the available social science research. In fact, there has been a tendency to ascribe the increasing rise in urban violence, particularly against women, to the lack of employment among the perpetrators. Craig Jeffrey, professor of development geography at the University of Oxford who has been mapping the lives of unemployed youth in Meerut, believes the social fallout will be complex. Known for his book Timepass in which he maps the lives of the educated unemployed in the Uttar Pradesh town, Jeffrey told Down To Earth that it is “nonsense” to stereotype responses to youth unemployment. “On the one hand, there is the prospect of lots of unemployed youth moving into semi-legal and sometimes “predatory” (corrupt) activity within the informal economy, for example running tutorial institutes and fake degree colleges and therefore becoming complicit in the reproduction of the system that created them as educated unemployed youth.” On the other hand, “educated unemployed youth are often involved in positive action, for example as whistleblowers with respect to corruption, social entrepreneurs, and ‘motivators’ in their local communities”. 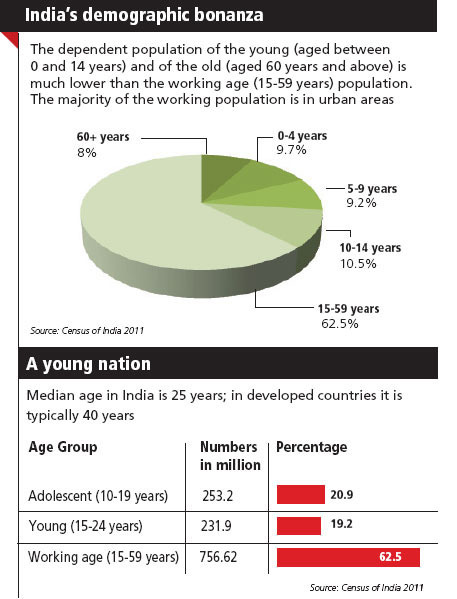 In either case there is much to worry about if instead of a demographic dividend the youth bulge becomes a liability. Kamran Alam has worked in Saudi Arabia for nearly six years as a quality officer at a company called Metal Service. On Cinema Road in Bihar’s Gopalganj district, he has started a training institute to provide skills to unemployed youths of Gopalganj and Siwan districts. The nameless institute–everyone refers to it as Kamran ustaad’s school–employs retired technical professionals who have returned from gulf countries to impart skills of welder, fabricators, mason, electricians and quality control. In these basic training centres, lectures are held in dingy classrooms lit by candles or battery-operated lamps in power-starved localities. There are no girl students, no toilets; water is provided in earthen pots. Posters of organisations and companies that will give certificate after the completion of the course are plastered on the walls. In Bihar’s boondocks, this is as good as it gets. Young school leavers cannot hope to get better training because the government’s Industrial Training Institutes (ITIs) are for the most part fossilised. In all there are 55 ITIs and as many private Industrial Training Centres in the state. Kamran claims that nearly all his best skilled students are waiting for their passports. “Once they get the passport, they will easily get a job in one of the companies in the Gulf,” he says. According to the Ministry of Overseas Indian Affairs, Bihar is the third largest state in the country with emigrant workforce of 50,227 persons working overseas. A major part of this workforce is in gulf countries like Saudi Arabia, Kuwait, Bahrain, Dubai, UAE and Kuwait. 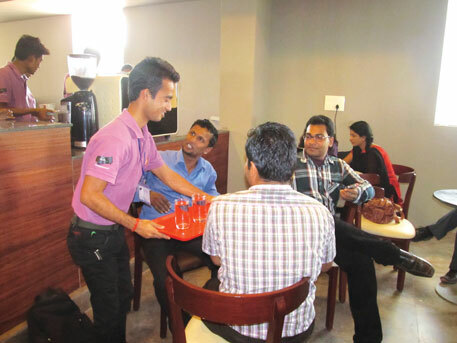 Nearly, 70 per cent of this workforce is from Siwan and Gopalganj. RBI statistics show that Siwan and Gopalganj bring in foreign remittances of nearly Rs 120 crore annually. More than 60 technical institutes that run in two-or-three rooms are handled by professionals who are either retired or on a sabbatical. Ali Imam, who teaches electrical fittings, says it doesn’t matter that the institute has no machinery or equipment of its own. Students get a description of the kind of machinery they would be expected to work on and told how to run them. “Oil companies are the prime employers in West Asia and these companies have the kind of sophisticated equipment that government- or privately-owned institutes can never afford,” says he. In training and selection for employment, there is no involvement of government, except to provide passport. A visit to the Siwan ITI proves the point that students prefer ustaad-style training centres. Rajkumar Thakur, principal of the ITI, confesses that 20 per cent of the seats lie vacant in the institute. On account of the poor interest, the ITI is planning to close the dressmaking course that was recently started in the women’s wing. But on the plus side, it managed to get its first campus placements when Tata Motors hired 39 of its students this year. Girls, who have been missing in large numbers from the workforce in Bihar, are now taking to technical education, but in a trickle. In the Patna ITI, Neha Kumari and Puja Kumari are the only two girls in the swarm of boys. Coming from extremely poor families, Neha and Puja have their own compulsions for joining the instrumentation course. “We know that the placement here is poor, but our parents can’t afford to send us to other states for technical education,” says Puja. But job opportunities are opening up selectively. For instance, girls attending Raymond’s Tailoring Centre are getting instant placement. Sanna Praveen and Afsana Praveen, who graduated last month, say they already have four placement offers. 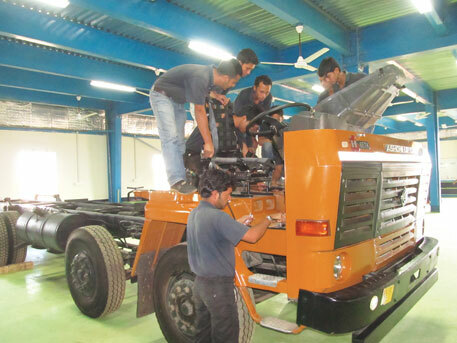 In neighbouring Uttar Pradesh, too, things are looking up for ITIs as companies begin to take a hand in the machinery course and training that these institutes offer. The state has about 328 polytechnic institutes, in addition to the 1,590 ITIs and a host of smaller vocational training centres. Even if the entire capacities of the private sector are included, Uttar Pradesh’s training can only cater to 400,000 youths. “This is less than a quarter of the demand which is roughly for 2 million seats. That’s why our young people go to private institutes,” says Vikas Gothawal, special secretary and director of the UP Skill Development Mission. Mishra ’s organisation now runs vocational centres in the backward and leftwing extremism-affected districts of Odisha and Andhra Pradesh. To date Gram Tarang has trained over 40,000 young men and women from the socially and economically challenged sections of society and has managed to place 80 per cent of them, he claims. One of the success stories of Gram Tarang is that of Pratima Haro, a tribal girl from Odisha’s Sambalpur district, who worked as farm labour before joining the industrial stitching course at Gram Tarang’s Employability Training Services, the vocational wing of Centurion University of Technology and Management in Paralakhemundi in Odisha’s Gajapati district. Pratima, who was quickly picked up by a Chennai-based garment manufacturer, counts herself lucky although the wages are a pittance. The issue that is worrying everyone, as it does Mishra, is the “desperate shortage of trainers”. Mishra thinks institutional capacity is not being built into the skilling mission, which he describes as “a fabulous concept that ignores certain ground realities”. He also insists that skill development should be institutionalised and not corporatised. Mishra says small vocational training centres such as his are being bullied by big corporate partners who are laying down rules that suit them, and NSDC, inadvertently, is allowing them a free run. This is the big challenge as most of the jobs are in the industrial belts and require young people to relocate to distant states. Quite often young people, specially girls, throw up their jobs and return to homes, unable to take the loneliness of life in a different setting. Besides, the wages are a pittance. Girls from Odisha’s tribal belt working as sewing machine operators in Bengaluru’s garment factories earn around Rs 7,000 a month, leaving them little money to send back home. Acquiring skills appears to be a small part of the struggle for the young. Getting decent work with decent pay is the hardest bit. The big question mark is over jobs. India’s ability to make the most of its favourable demographics will depend as much on skilling the people as creating job opportunities for the additional millions who will be swelling the labour force by 2022. Converting growth into employment has not been India’s strong point and it is here that the challenge will be particularly tough. The recently released “The India Labour and Employment Report 2014” by the Institute for Human Development (IHD) has some useful pointers to what lies ahead. It says that although overall unemployment is low, at a ridiculous 3 per cent, the problem of youth unemployment, particularly that of educated youth, has become a major concern. About 30 per cent of the total unemployed in 2011-12 were graduates and above, up from 21 per cent in 2004-05. It computed the rate of unemployment among graduates, and surprisingly among the technically trained at around 18 per cent. But this is not an India phenomenon alone. The world over joblessness is growing and more young people are becoming idle than ever before. According to estimates by the OECD, around 26 million youths in the 15-24 age group in developed countries are NEET, that is, not in employment, education or training. It says the rate of youth unemployment has shot up by 30 per cent since 2007. But estimates of worldwide unemployment among the young by other organisations are more dismaying. The ILO puts the figure of the idle young at 75 million while World Bank surveys show that close to 262 million young people in emerging economies are hunting for jobs. Economist Alakh N Sharma, director of IHD, warns that rising graph of unemployment among the educated in India is a serious worry. “This will haunt us in the future,” says Sharma, who points to a more problematic issue: unemployment among educated women in some states is as high as 55 per cent. In a decade or so, 40 per cent of all girls will be matriculates, adding to a cohort of educated youths who are being denied job opportunities. Since school enrolment has become universal, the larger numbers of the educated youth will pose a multitude of problems. They won’t want to work in the farms or under MGNREGS and this force will have huge implications for resource allocations, for transport, for the environment. The youth bulge has to be factored in carefully into all development plans, says the lead author of the IHD report. One consequence of the lack of decent job opportunities is that the young have been pushed into partial or disguised unemployment. 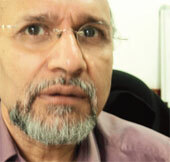 Even those who believe they are skilled, such as Arun Kumar. The 25-year-old from Warangal in Andhra Pradesh is a commerce graduate with a diploma in marketing from a management institute. After the company he was working for folded up, Kumar has taken up a variety of jobs, from cold calling to peddling products at petrol stations. “The work is poorly paid and dead end,” says a hugely frustrated Kumar, who is not sure if the economic recovery will make it worth his while to study further and seek employment later. But for him, the bad news is that jobs in India grew by just 2.2 per cent between 2010 and 2012. An ILO report, Global Employment Trends for Youth 2013: A generation at risk, highlights the major challenges regarding the quality of available work for young people in countries such as India. “In developing economies where labour market institutions, including social protection, are weak, large numbers of young people continue to face a future of irregular employment and informality. Young workers often receive below-average wages and are engaged in work for which they are either overqualified or underqualified,” it says. The key issue is whether there will be decent jobs for the young of India. Job data culled from the NSSO report for 2011-12 released in February shows that since 2000s employment in trade, hotels and restaurants rose from 36 million to 53 million. But these were low paying jobs even during a period of high economic growth. Between 2004-05 and 2011-12 when GDP growth peaked to 8.5 per cent per annum, employment grew by just 0.5 per cent annually. About 92 per cent of India’s 470 million workers are informal workers, forced to take up jobs that are tenuous, are poorly paid and offer no social security. While acknowledging that this has shackled growth, government is now pinning its hopes on the Delhi-Mumbai Industrial Corridor (DMIC) to spur growth through the manufacturing and double employment potential in seven years. DMIC is envisaged as the backbone for creating a global manufacturing and investment destination. But until that happens the outlook on employment remains grim. Sharma explains that the service sector has a lower multiplier effect than manufacturing where job creation results in less inequality. But there have been plus points, too, which augur well. The biggest positive has been the growth in real wages of over 3 per cent per year on average between 1983 and 2012. Labour productivity, too, has also shown an increase. Vocational education (education based on occupation or employment), also known ascareer and technical education (CTE) or technical and vocational education and training (TVET) is education that prepares people for specific trades, crafts and careers at various levels from a trade, a craft, technician, or a professional position in engineering,accountancy, nursing, medicine, architecture, pharmacy, law etc. Craft vocations are usually based on manual or practical activities, traditionally non-academic, related to a specific trade, occupation, or vocation. It is sometimes referred to as technical education as the trainee directly develops expertise in a particular group of techniques. Vocational education may be classified as teaching procedural knowledge. This can be contrasted with declarative knowledge, as used in education in a usually broader scientificfield, which might concentrate on theory and abstract conceptual knowledge, characteristic of tertiary education. Vocational education can be at the secondary, post-secondary level,further education level and can interact with the apprenticeship system. Increasingly, vocational education can be recognised in terms of recognition of prior learning and partialacademic credit towards tertiary education (e.g., at a university) as credit; however, it is rarely considered in its own form to fall under the traditional definition of higher education. Vocational education is related to the age-old apprenticeship system of learning. Apprenticeships are designed for many levels of work from manual trades to high knowledge work. Our school education system offers combinations of courses in the higher secondary level such that a student by choosing these groups can pursue engineering or medicine, even though these two streams call for entirely different aptitudes. The ideal higher secondary system would orient the student towards evaluating their aptitude and choosing to pursue one of the two streams. This would ensure that the chosen stream matches their aptitude. This is not happening now. In the absence of proper orientation in the system, parents and their wards follow an inappropriate procedure while selecting their branch of study in the college. During counselling, we notice that the selection of a branch of study is based on the following: (1) The most sought-after branch in counselling, (2) The branch having good job opportunities as seen by the previous year placements, (3) Parental pressure and (4) Peer pressure. This is not the right practice. The correct way will be to spend some time assessing oneÃ”Ã‡Ã–s interest for a particular branch and check if it matches well with the aptitude one has and the chosen branch of study. It is because of such practices that we face problems of employability and dissatisfaction in existing jobs, which can lead to high turnover rates, low productivity and increase in the stress level of employees. India produces 50 lakh graduates every year. Experts say with poor English language skills, computer training and analytical ability, making the cut from the classroom to the boardroom is not easy. According to Labour BureauÃ”Ã‡Ã–s Ã”Ã‡Â£Third Annual Employment & Unemployment Survey 2012-13Ã”Ã‡Ã˜ released on (November 29, 13), unemployment rate amongst illiterate youth is lower than educated youth. A comparison with the earlier report by labour bureau shows that the unemployment level has increased during 2012-2013 over 2011-2012. While unemployment rate among illiterate youth is lowest with 3.7 per cent for the age group 15-29 years at all India level in 2012-2013, the unemployment rate in the same category was reported at 1.2 per cent in 2011-2012 report. Similarly, the unemployment amongst the graduate youth that happened to be at 19.4 per cent in 2011-2012 increased to 32 per cent during 2012-2013. The Labour Bureau survey further shows that every one person out of three persons who is holding a graduation degree and above in the age group 15-29 years is found to be unemployed. The need of the hour is practical training at all levels of Higher education.